The below statement comes from an announcement via Eggland’s Best. Braswell Family Farms is the second-largest franchisee of Eggland’s Best eggs and markets them to quality-minded retailers in the mid-Atlantic region. 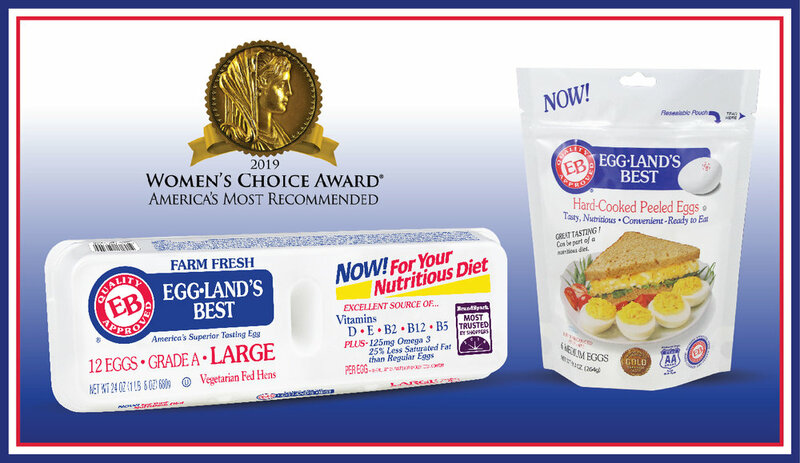 For the fifth consecutive year the Women’s Choice Award®, the leading advocate for female consumers, has named Eggland’s Best America’s Most Recommended™ Eggs. Eggland’s Best was also chosen as America’s Most Recommended™ Hard-Cooked Eggs for the second year in a row. The Women’s Choice Award® seal helps women make smart choices for themselves and their families based on the experiences and recommendations of women across the nation. Brands are selected to receive a Women’s Choice Award® based on a national survey that is distributed to over 100,000 women nationwide each year, asking them to select the brands they most highly recommend to their family and friends. The award seal represents the extraordinary power and significance of today’s female consumer in determining the most recommended brands, products and services. Compared to ordinary eggs, Eggland’s Best eggs contain six times more vitamin D, 25% less saturated fat, more than double the Omega-3s, ten times more vitamin E, and more than double the vitamin B12. The superior nutrition of Eggland’s Best is due to its proprietary all-vegetarian hen feed that contains healthy grains, canola oil and a wholesome supplement of rice bran, alfalfa, sea kelp and Vitamin E. In addition, independent testing has revealed that Eggland’s Best eggs have stronger shells than ordinary eggs, which leads to less breakage and helps them stay fresher longer. Eggland’s Best eggs have been the recipient of more than 100 awards and honors for the product’s superior taste, nutrition, freshness, and variety. For more information about the Women’s Choice Award®, visit www.womenschoiceaward.com.